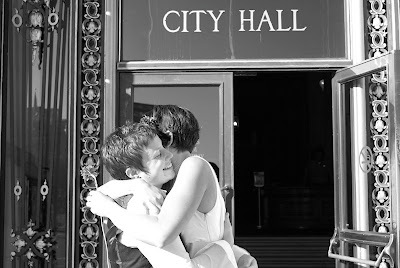 As the fight for equal access to formalized commitment continues to rage across our country, I wanted to take a moment to share the names, faces, and story of one couple who is at the forefront of that movement. Mary and her wife, Kerry, were married on November 4. 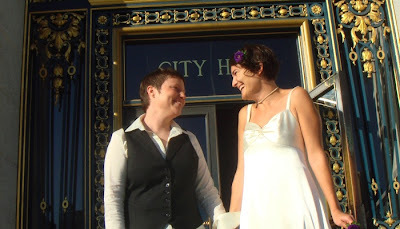 At the time, they were working on the "No on Prop 8" Campaign, and they realized that they needed to "jump in head first" and get legally married before California squelched their right on November 5th. 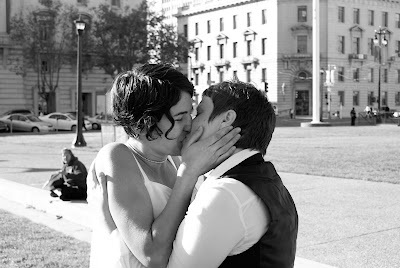 We booked the last possible appointment to get a marriage license in San Francisco and planned a quick wedding in 1 1/2 weeks. Two friends and our minister were in attendance. We made our rings in our friend's kitchen kiln. I carried a single flower from a bouquet my mom sent us from Michigan. 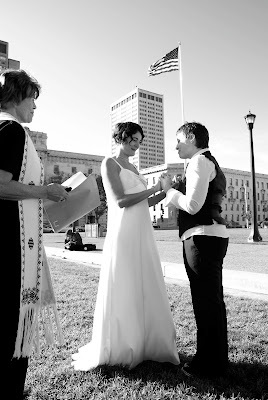 My crying mom attended the wedding over the phone because she wasn't able to book a last-minute ticket to make it for our big day (plus, she had to stay home and vote). Now, they are in the process of planning a wedding celebration that brings together all their friends and family. You can check out their wedding website for more information and photos. To Mary and Kerry: May the wind of liberty and justice for all come sweeping through our country and find its way into every state, city, and home. These pictures are giving me goosebumps - they look soooo beautiful! Seriously. What Sara said. Go get 'em girls. Amen to that. They look so happy and in love. It breaks me heart that there are people in this world who want to deny them their happiness. The winds of change are here- Prop 8 will be defeated, maybe not today, but soon. Love really is all you need - well once the stupid people get their acts together. How can anyone deprive anyone of wanting to openly declare their love. Congratulations.